In December of 2012 I arrived at “The Wall.” I had never been to this wall before, and really didn’t know what it was when I first encountered it. All I knew was that it scared me and shook me to the very core of my being. It only got worse as I learned that I had to dig in, and go through the wall. Honestly, there have been times I wondered if I would make it. What am I talking about you ask? Well, I guess the best place to start is at the beginning. Things went down at the church where I was serving that hurt me deeply. I experienced feelings of betrayal and rejection, the likes of which I had never known. I left in a daze not knowing what I would do. An opportunity soon presented itself at another church, so, I became their Worship Pastor. The people were awesome! They accepted me and treated me with nothing but love. But something just wasn’t right- with me. Looking back, I now know that I should’ve never taken the position. They were looking for a Worship Pastor, and wound up getting a man who was living in the shadow of “The Wall.” So, nine months later I resigned. And it was time to start digging. “Stage 4 is “the journey inward” – “a deep and very personal inward journey” that “almost always comes as an unsettling experience yet results in healing for those who continue through it.” In this stage, our former views of God are radically challenged. The disruption can be so great that we feel like we are losing our faith or betraying loyalties. At this stage, we face an abrupt change (at least many do) to almost the opposite mode. It’s a mode of questioning, exploring, falling apart, doubting, dancing around the real issues, sinking in uncertainty, and indulging in self-centeredness. We often look hopeless to those around us. The crisis shocks our system. We lose comfort and question our convictions as our previous faith-supports crumble before our very eyes. For the first time, our faith does not seem to work. We feel remote, immobilized, unsuccessful, hurt, ashamed, or reprehensible. Neither our faith nor God provides what we need to sooth us, heal us, answer our prayers, fulfill our wishes, change our circumstances, or solve our problems. Our formula of faith, whatever that may have been, does not work any more, or so it appears. Why does advancing to this stage usually demand a crisis? The reason is simple: No one would choose this kind of experience on their own! Most of us are so comfortable and self-sufficient at the previous stage (called the productive or fruitful life) that we have no natural tendency to move at all. In fact, stage 4 does not even look like part of the journey for those of us at home in stage 3. It does not appear to be an extension of our faith and growth. Consequently, we are not drawn in this direction. Our aversion to stage 4 is increased because of the very real dangers that accompany this stage. “Sometimes people drop off the journey totally at this point. Overwhelmed by pain or crises in our lives, we absolutely cut ourselves off from God.”. Only through self-acceptance and surrender to God’s will can one go “through” the Wall to deeper levels of spiritual growth. “The power behind the transformation at the Wall is this: learn to embrace your whole story with loving, forgiving detachment.” We must accept ourselves with all our wounds and imperfections. We must experience God’s love and acceptance of us as we are in all our weakness and humanness. And then we must fully and completely surrender to God’s will, even though we remain in the dark. In the passage I quoted at the beginning this article, God had told Ezekiel to dig through the wall and he would see the sins and abominations of Israel. But digging in my own wall would reveal some unsettling things about me. I no longer felt God’s presence. My prayer life and time in the Word was almost nonexistent. I felt like I was literally falling apart, and I began to self-medicate. Old patterns of behavior were beginning to resurface and I was afraid! I began to isolate, and of course I lied (except to a few, and at times, even to them) when anyone would ask how I was doing. I could tell my family was worried and afraid for me. “Dear God! I’m supposed to be a minister of the gospel and I’m beginning to wonder if I’m even saved.” There was deep darkness and an impending sense of doom. 1) I was hurt by what went down at my former church. The hurt was legitimate. But much of the hurt was my own doing. Didn’t they see that I was right? Had they forgotten how anointed I am? How could they treat me this way after all I had done for them? I was forced to ask myself how much of my ministry has been truly motivated by love. 2) At times, I have cared more about receiving recognition than people. For example: I was talking to a brother on the phone, and he was telling me of his struggles, and I was offering what I prayed was good advice. The next day he called back explaining how the Lord had ministered to him, revealing some things to him that helped him see a little more clearly. Honestly, instead of being grateful that God had helped him, I was more upset by the fact that he didn’t mention that it was I who had told him the very same thing the night before. Or, what about the times I have led worship and the presence of God really “showed up,” and I felt like somebody should’ve recognized me as “the vessel.” How twisted is that? 3) My theological studies have caused me to be arrogant and pharisaical at times. I have often debated with others to prove myself right rather than help them see what I believe is the truth. 4) How many times have I watched videos of myself leading worship or preaching not so that I might improve, but because I just wanted to see how I looked? 5) More times than not, my, “It aint all about me.” was ALL ABOUT ME! 6) There have been times when I have posted on NLI not out of a sincere desire to minister, but rather for the traffic. 7) How many times have I “performed” instead of ministering? I could probably go on, but I’m sure you’ll agree that that this article has gone on long enough. Honestly, I don’t really know if writing this was more for me or you. If you’ve arrived at “The Wall” I just pray you are encouraged by it. No one can go with you through the wall except for Jesus, and you’ll probably think he’s deserted you. There will be others who pray and lift you up, but you won’t realize nor appreciate it at first. As for me, I don’t think I’m through digging yet, but I do believe I’m starting to see a little light. Hallelujah! God is faithful and he really does love us! Previous Post Time Well Spent? “I was surprised, Kyle, that you didn’t mention my name. Oops, my bad. Seriously, I love that you are experiencing this. 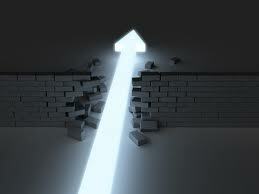 God’s walls are His goodness in conforming us to Christ’s image. Changing metaphors, the following is a prose poem I wrote back in 2005. It described my situation and feelings at the time. breaking against the rocks and shore. But be at peace in the promises of God. He is the God of the boat! Kyle, thanks for sharing this! Kyle! A word in due season. Miss you, brother. Feels like you and I are starring at the same wall. My spirit is wandering. Pray for me! Blessings.